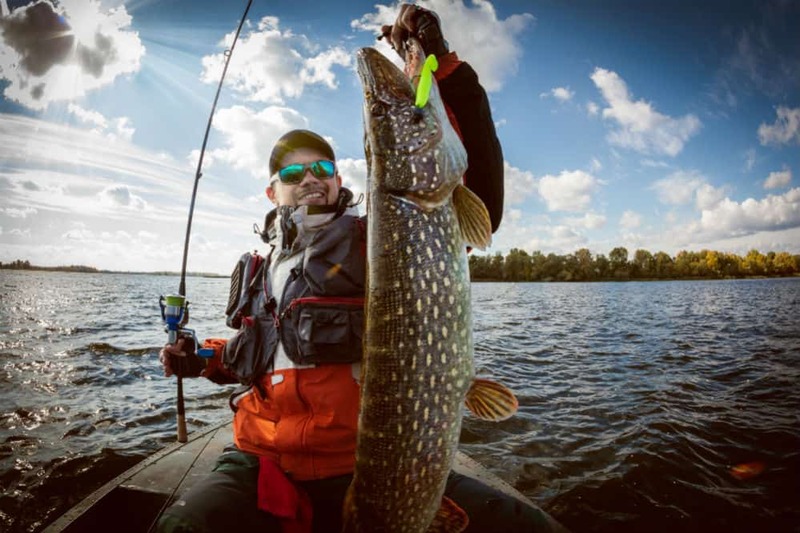 Regardless if you are a recreational angler or a professional who takes part in fishing tournaments, you always need a good-quality fish scale with you. However, with so many designs and options available in the market, it is often a headache to choose the best digital fish scale that fits your needs. Even though almost all fishing scales are hanging scales, there are still a lot of variations available in design and use. From basic, traditional models to more high-tech options, you can find a lot of choices from some well-known brands. For those who are looking for a good digital fish scale, we have listed the three top options in this article. Read ahead to learn about them and why we listed them as top options. The Dr. Meter Digital Fish Scale is a simple yet functional fishing scale that makes it convenient for you to weigh your catch. It comes with a sturdy metal hand strap that allows you to hold the scale upright. The weight capacity of this scale is 110 pounds, which means it is good enough for long trips and weighing more than one fish at a time. It is also a highly reliable scale as the accuracy rate is five to 10 grams. The EP-PS01 is not merely a weight scale as it also features a measuring tape that can help measure the length of the fish quickly (up to one meter). The weight is displayed on an LCD screen with a backlight that works perfectly even when it is dark. You can also see the weight in different units as it has a weight unit switch. You can easily switch between pounds or kilograms with a single press of a button. The scale is powered by two AAA batteries that last for an extended period. It also saves battery through its auto-lock function that switches on when the scale is not in use for a while. The hook on this scale is made from high-quality stainless steel and goes into a slot on the back of the scale. This makes it a convenient and safe scale to keep in your pocket. The overall make of the Dr. Meter scale is of high-quality ABS material. 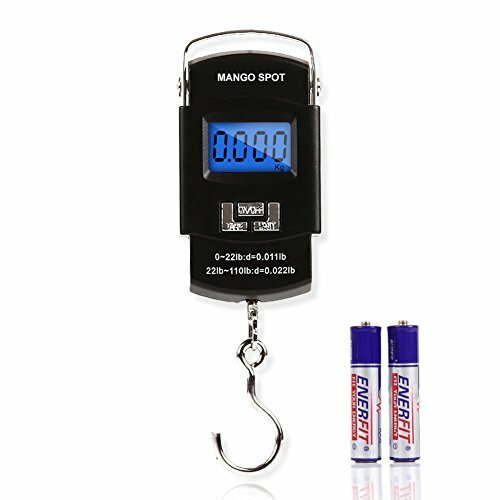 If you are looking for a simple fishing scale that is sturdy, functional, and offers great value for money, then the Mango Spot might just be the scale you need for your fishing adventures. It has a weight capacity of 50 kg or 110 pounds with an accuracy of 10 grams or 0.01 pounds. It is a hanging scale with a strong stainless steel hook. It may be a weight scale for fishes, but you can virtually use it for anything else as long as the weight does not cross 110 pounds. There is a metallic handle on top to hold it. The scale features functions such as the data lock and tare function. It runs on two AAA batteries. The scale itself is lightweight and portable, weighing a mere 154 grams. The LCD screen switches off by itself after two minutes if the scale is not used. It also indicates overload if the weight crosses its measurable limit. The LCD screen is not big, but the weight is displayed digitally across the screen, which makes it quite legible. The screen also has a blue backlight to make the text readable in the dark as well. 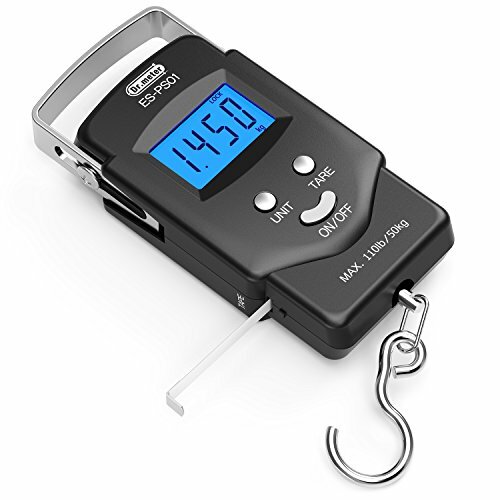 Through the help of this scale, all of your catch’s weight calculations become automatic, all thanks to this quick and convenient fishing scale. 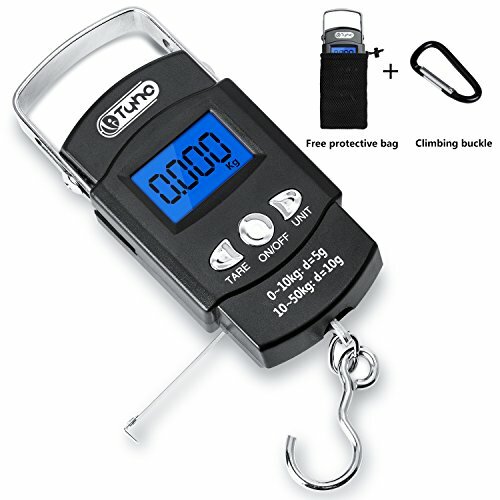 The TyhoTech Fishing Scale is a digital scale that comes with a protective carrying bag and a climbing buckle. This one, too, like most other digital fishing scales, is able to weigh up to 110 pounds of catch. The accuracy of this scale is also 10 grams. The weight can be displayed in multiple units, switching between kilogram, pounds, and ounces. It features a measuring tape as well to make things more convenient for competitive fishing. The tape’s units are centimeters and feet. The highest measure is one meter/three feet. It is a lightweight scale that can easily fit in your pocket or pouch. You can also weight your luggage using this scale as it is designed to be sturdy and accurate enough to weigh large objects like luggage. It comes with a small user guide to help you acquaint with its functions even though it is very simple to use. The overall make of this scale is good quality. You will not have to replace it any time soon. At most, you might need to replace the batteries when their life ends. Powered by two AAA batteries, the device shuts off in 120 seconds after inactivity. Speaking of batteries, they are securely fixed in with a tough cover so that they do not fall out when you are hastily moving your catch and weighing it during a fishing tournament. Digital fish scales are regularly used by fishermen and professional anglers for competitive fishing. They are reliable, accurate, and quick. All three products listed above are somewhat similar as they have the same weight capacity and accuracy. However, the Mango Spot Fish Scale does not have a measuring tape. A measuring tape comes in handy during fishing adventures to measure the catch’s length as it is an important parameter of fishing competitions. Even though they are all made from high-quality materials, these fishing scales are prone to damage from water. You cannot use them on a rainy day. That said, they are highly portable and convenient to use. While there are more expensive options available in the market, these fishing scales are cheap but as reliable as any of the high-tech ones with advanced features. So, which one do you think is the best digital fish scale for you?